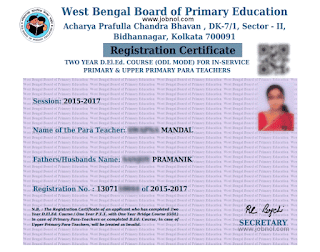 WBSED DELED Training OLD Mode for Para Teachers; West Bengal Board of Primary Education has recently published a notification for Qualification Up-gradation of Eligible Untrained In-Service Para Teachers engaged in the Primary Schools of West Bengal. On 31/03/2016 WBBPE issued a continuation notice regarding WBBPE/WBSED D.El.Ed Training of In Service Para Teachers of Primary Schools. This notification has been published below with the original link to download the same. Read the notice & take appropriate action as required. 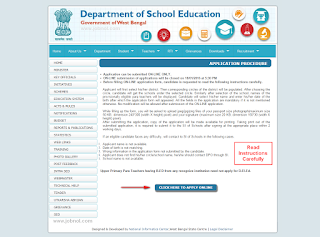 The applicant Para Teachers who could not downloaded their Registration Certificates, are hereby requested to download the same on and from 1 PM of 04/04/2016 from the link to the website www.wbsed.gov.in until further notification. The PBSSM approved para-teachers who could not yet submitted their online applications for Registration, are hereby requested to apply online on and from 1 PM of 04/04/2016 through the concerned Sub-Inspector of Schools (PE) of his/her Circle of the district until further notification. They will be able to download their Registration Certificates after approval of the concerned D.P.O. and acceptance of the W.B. Board of Primary Education upon further notification. 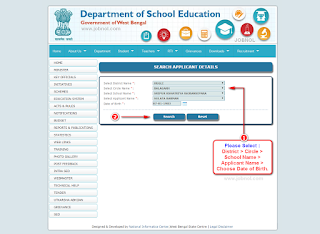 The PBSSM approved applicant para-teachers who have already downloaded their Registration Certificates, which contain errors, are also hereby requested to correct/modify their errors online on and from 1 PM of 04/04/2016 through the concerned Sub-Inspector of Schools (PE) of his/her Circle of the district until further notification. In such cases they will get new Registration Certificates marked “Modified” on each. Update Regarding "D.El.Ed Registration" of Para Teachers. 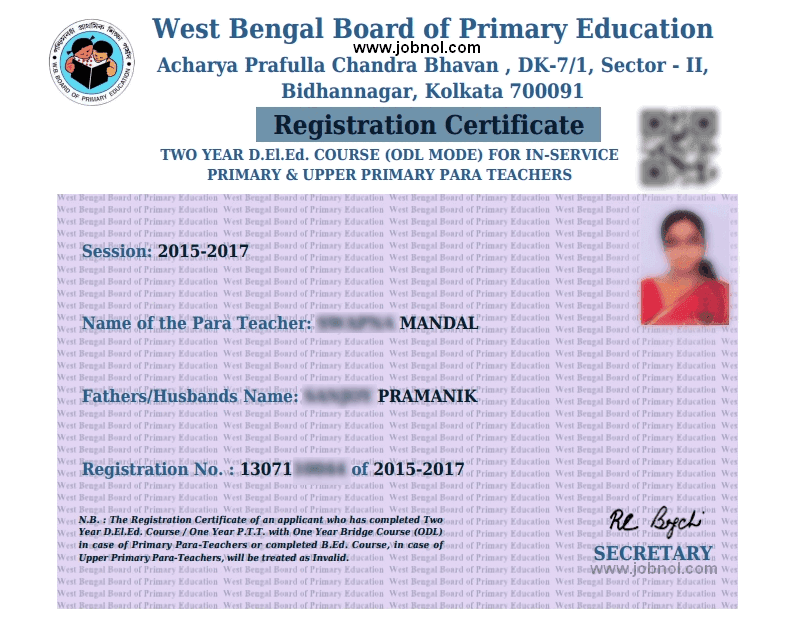 A Registration Certificate is being issued to the Candidates who Applied for Two Year D.El.Ed Training of Para Teachers of Schools in West Bengal. Please Play the Slideshow Below Get All The Details Instruction, Please "USE Computer" or open www.wbsed.gov.in to get your Registration. 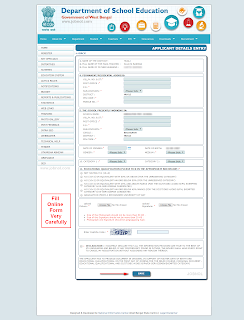 Step wise Application Process (with screenshot) has been uploaded. Online Form Fillup Last Date : Until Further Notice. Application can be submitted ON-LINE ONLY. Before filling ON-LINE application form, candidate is requested to read the following instructions carefully. Applicant will first select his/her district. Then corresponding circles of the district will be populated. After choosing the circle, candidate will get the schools under the selected circle. Similarly after selection of the school, names of the provisionally eligible para teachers will be displayed. 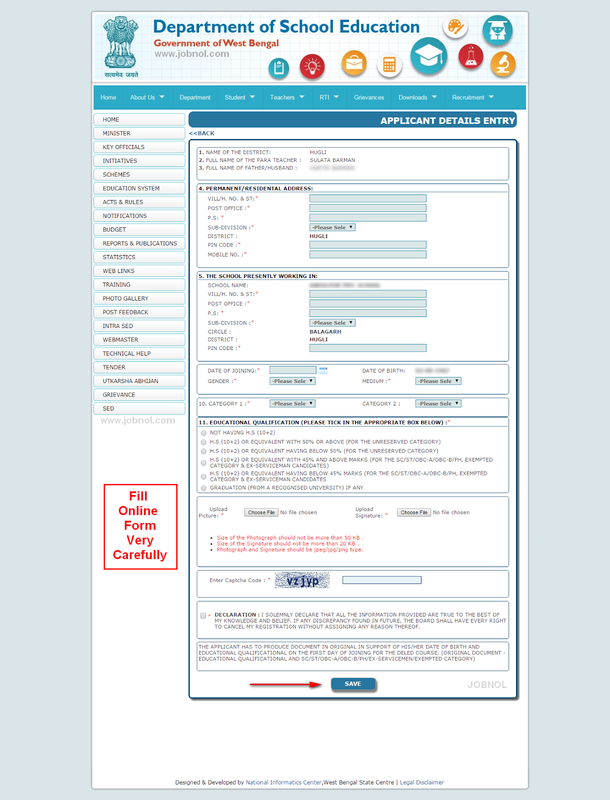 Candidate will select his/her name and enter his/her date of the birth after which the application form will appeared. All the fields in the application are mandatory if it is not mentioned otherwise. No modification will be allowed after submission of the ON-LINE application. While filling up the form, you will be asked to upload jpeg/jpg/png files of your passport size photograph(maximum size 50 KB, dimension 240*300 (width X height) pixel) and your signature (maximum size 20 KB, dimension 150*30 (width X height) pixel). After submitting the application, copy of the application will be made available for printing. Taking print out of the submitted application, it is required to submit it to the SI of Schools after signing at the appropriate place within 2 working days. If an eligible candidate faces any difficulty, will contact to SI of Schools in the following cases. Applicant name is not available. Date of birth is not matching. Wrong information in the application form not submitted by the candidate. Applicant does not find his/her circle/school name, he/she should contact DPO through SI. School name is not available. Upper Primary Para Teachers having B.ED from any recognize institution need not apply for D.El.Ed. 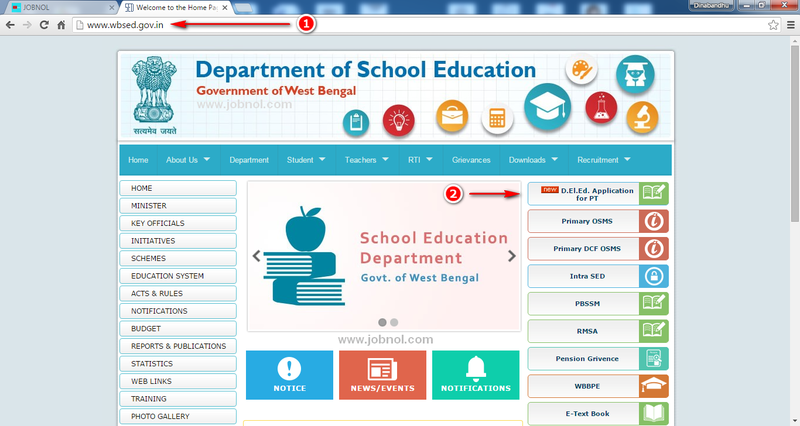 Step 2) See Right Menu and Click on "D.El.Ed Application for PT". 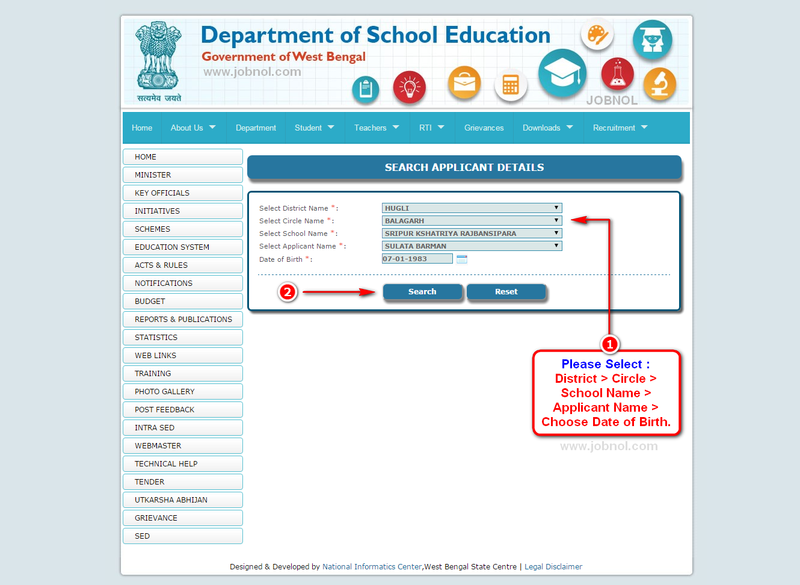 Read The Instructions Carefully and Click on "CLICK HERE TO APPLY ONLINE"
Step 3) From DropDown Menu Select District Name > Circle Name > School Name > Applicant Name & Provide Date of Birth. Finally Click "Search" Button. Step 4) Your Applicant's Registration Profile will appear and you should fill your details properly and upload Photo & Signature. Check/Verify Details. Finally Click SAVE Button. Final Step) Now your Details will be saved in to the server. and you will get a registration confirmation details. Take Printout. and Submit the Same to the Office of The SI of Schools. In continuation of Notification No. 2587/BPE/2015, Date – 29-12-2015, this is to further notify for information for all concern that the process for the Online Registration into Two year D. El. Ed. Course, 2015-17 through ODL mode for the eligible untrained In-service Para Teachers will be started from 8th January, 2016 (Friday) at 11.00 A.M. and will continue upto 18th January, 2016 (Monday) 5.30 P.M. through the website:- www.wbsed.gov.in. This is to notify for information of all concerned that the process for the online registration into Two Year D.El.Ed. 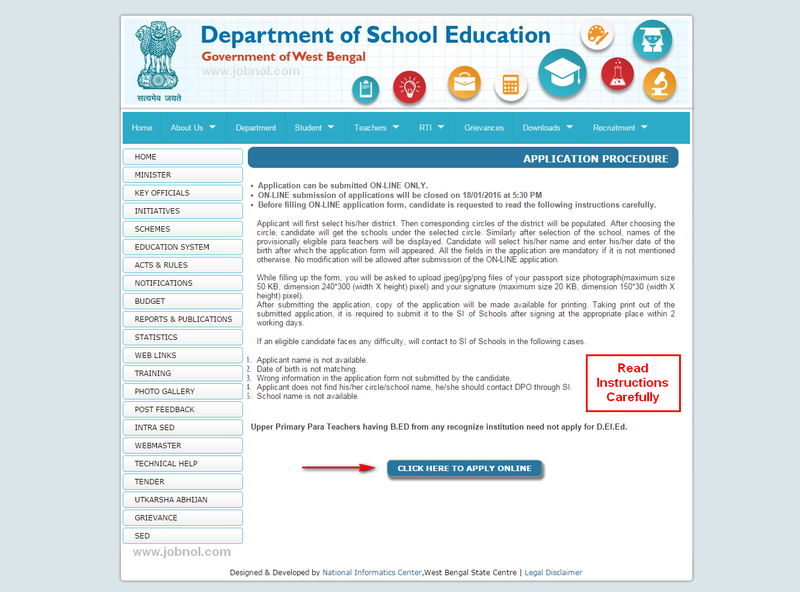 Course (through ODL Mode), 2015-17 for the in-service Para-teachers, engaged under the approval of the Paschim Banga Sarva Siksha Mission, is going to commence in terms of the order of the Government of West Bengal in the Department of School Education, No 766-SSE/15, Date: 18/12/2015, read with the approval-order of the NCTE No. F.62-3/2011/NCTE/N&S, Date: 24/04/2015 and subsequent clarifications in November-2015. The eligible untrained in-service para-teachers are requested to register themselves online through www.wbsed.gov.in for the Two Year D El Ed course (through ODL-Mode)-2015-17. The date of starting of online registration will be published on 4th January, 2016. The applicant should be working as a para teacher under the approval of PBSSM for at least two years and he/she should be eligible to be engaged upto 60 years of age as per Notification No. 273 SE(P)/PBRPSUS/ADMN/9/04-05 dtd 23-04-2010 read with no. 376-SE(Pry) dtd 09-06-2010. ♦ not having passed the H S or its equivalent examination with 50% or 45% (as the case may be). the applicant para teacher must have registered himself/herself with the West Bengal Council of Rabindra Open Schooling (WBCROS) or National Institute for Open Schooling (NIOS) for upgradation of academic qualification. Such candidates, must put the registration/enrolment number at the time of online registration. The Two year D.El.Ed. course (through ODL-Mode)-2015-17 for the in-service Para-teachers is being conducted by West Bengal Board of Primary Education in accordance with the approval order of the NCTE mentioned herein above. A para teacher undergoing the Two Year D.El.Ed. Course through ODL mode may simultaneously upgrade his/her academic qualification for the course or percentage of marks in the H.S. or its equivalent examination through either WBCROS or NIOS. But she/he will not be declared to have passed the training course, unless and until she/he attains the minimum academic qualifications through such up-gradation. The registered para-teachers will be informed of their study centres through the D.I./S.I.s of Schools of the respective districts. Such registered para-teachers will be provided with the printed study materials and details of the course from their respective study centres. *** Declaration :: The notice reproduced here was originally published @ WBBPE's Official Website (www.wbbpe.org). If you wish you may download the Original Notice by clicking here. Thank you! Source : Newspaper "EiSamay @ 31/12/2015"
0 Comment to " WBSED/WBBPE D.El.Ed ODL Mode for Para Teachers Online Application & Registration Download - wbsed.gov.in "